1978 was a good year for Neil Young. A successful tour and several new songs seemed to signal that he, unlike many other dinosaurs from Woodstock, still had a future ahead of him (and it turned out to be the truth – the following year's Rust Never Sleeps is one of his best albums). In August, Neil married blond Pegi, and their baby was due around Christmas. But little Ben was born a month early; the labor hadn't been particularly difficult, but the child had a severely deformed face. And he cried almost non-stop. After a couple of months, Ben's parents believed that the baby was in great pain and that his development was greatly delayed. The doctors said it was cerebral palsy. A similar diagnosis had been given to Ben's half-brother, Zeke, Neil's son from a previous marriage. But compared to Ben, Zeke was only lightly affected. Ben was spastic, partly paralyzed, was unable to speak, and had limited movement and comprehension. “Out of a hundred thousand newborns, seven are born with this. And two of them are mine,” – is what Neil told his father in a rare moment of despair. Yet there was no time for despair and it was pointless at that. The first job was to get Ben crawling. “We needed three people for that,” Young says in his book, Shakey. “Thirteen, fourteen hours, seven days a week. No breaks – one of the parents always had to be there.” After 18 months, Ben's progress could be felt, but it was small and difficult to evaluate. The Youngs started a new treatment program that put less emphasis on purely physical aspects, but rather concentrated on development as a whole. Pegi counseled other families with similar problems, and the onetime tour-maniac, Neil, now rarely stepped out onto the stage. He continued to compose songs, but they were so unpredictable that the David Geffen Co. sued their star in court, claiming that the new albums were “not commercial by nature, and are musically uncharacteristic of Young's previous recordings.” Ben grew up in a wheel-chair, and with the help of technological aids, could play and engage in limited communication with others. When the boy turned seven and it was clear that they wouldn't be able to find a school for him, Pegi and other like-minded people came up with the idea of establishing their own alternative school. 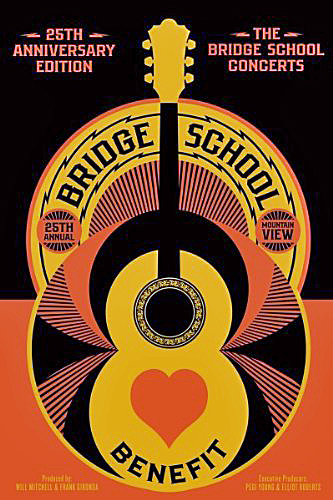 In the fall of 1986, Pegi and Neil organized a fund-raising concert for The Bridge School. Bruce Springsteen (who was one of the biggest stars in the world at the time), Tom Petty and Young's colleagues from his hippy days – Crosby, Stills & Nash, performed. Enough money was donated to assemble a professional team and to open the school for children with severe physical and speech disabilities. The Bridge School has now been operating for nearly 25 years and is an internationally-renown educational authority; with the aid of computers, the school's students develop their movement and verbalization skills, and improve their socialization abilities. Pegi Young still serves as the school's executive director. “It's all thanks to Pegi. I'm just a PR-sign,” Neil maintains. And 25 years on, not far from the school itself – at the Shoreline Amphitheater in Mountain View, California, benefit concerts for the school continue to be held, featuring the highest level of stars in in the music industry: Bob Dylan, Paul McCartney, Metallica, Tom Waits, Red Hot Chili Peppers, Elton John, Norah Jones, R.E.M., Coldplay, Arcade Fire, Beck, Pearl Jam, David Bowie, Billy Idol, Foo Fighters, Nine Inch Nails, Devendra Banhart, Smashing Pumpkins, Kronos Quartet, Patti Smith, Simon and Garfunkel, The Who, Fleet Foxes, and countless others. The concerts are uplifting and most of the artists perform acoustically. Students from The Bridge School have a place of honor on the stage, and Ben Young, now 33 years old, is always among them. Ben gets around with a wheel-chair, communicates with the world through the aid of a computer, and has run his own chicken farm for several years now. And he smiles a lot. Just as constant a face at the concerts is his father, who always performs. Emanating joy, Neil is dressed in his flannel shirt, baggy jacket, jeans and trainers, and has either a crushed wide-brimmed hat or baseball cap on his head. He sings his beautiful, romantic, angry and furious songs, and looks like a guy you'd really like to be. And right there on stage, behind Neil, blond Pegi still sings back-up and looks just as happy. Have a wonderful Christmas, friends!